I’ve posted How To: Set a Macs Time Server, How To: Sync Time With NTP via Script & How To: Check Your Active Directory Domains Time. They all came about when 1st looking at this issue, this last post in the series with use all those posts. Before we start, we need UDP port 123 open from clients to server. Now we need to figure out our domains primary NTP by using: How To: Check Your Active Directory Domains Time. (We’re using the domains primary NTP as we’ll be sharing it with clients & whilst we could use the same external source as our domains primary NTP, we could have an issue if we drift due to some communication issues). 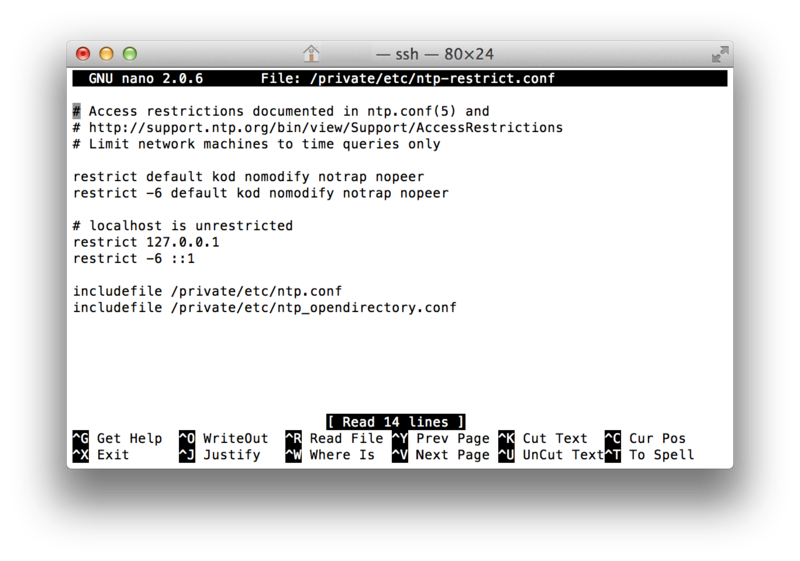 So with the domains primary NTP discovered, set this as the NTP on the OSX Server you’ll be using as an NTP server via How To: Set a Macs Time Server or just manually type it into the time server field in the Date & Time preference pane in System Preferences. This will allow clients to query the NTP server. But, there is much much more you can do with this file. For me I just wanted my Macs from anywhere to be able to use my Mac server as an NTP. Now, patience.. give it time (pun intended). The service can take a few minutes to start serving time. To verify use the method outlined in: How To: Sync Time With NTP via Script. This confirms my thoughts – we have lots of students who have trouble from time to time connecting to our wireless (it’s WPA2 w/radius) and time is the exact reason. This confirms what I was thinking. Thanks for the heads up, should be sorted now.